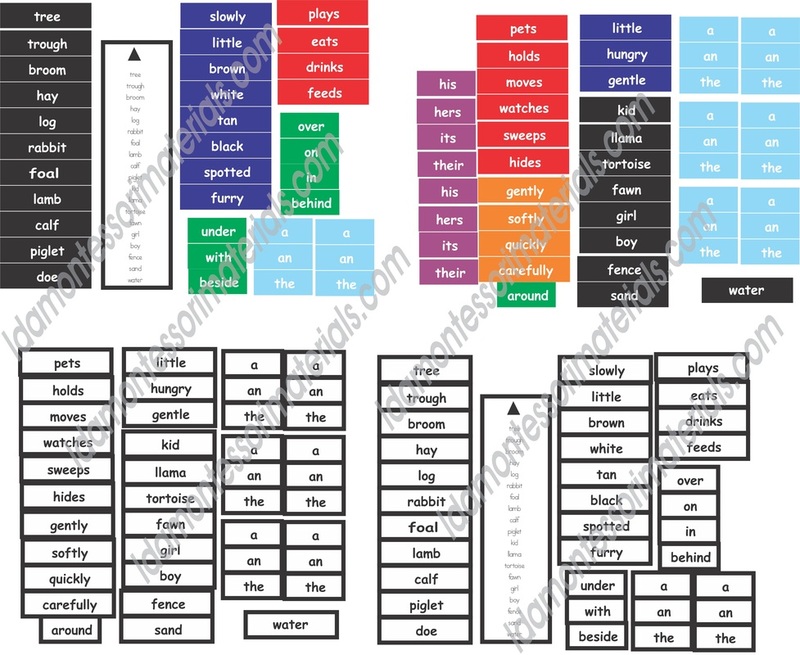 Vocabulary cards for syllable lessons and for language vocab journals. Includes the six syllable types, closed, consonant le, open, vowel team, silent e, and r controlled. 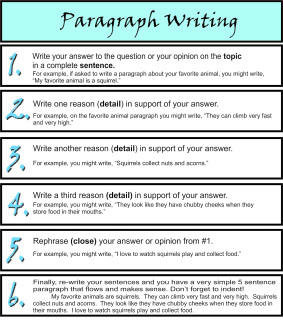 Just print on card stock and laminate and cut. 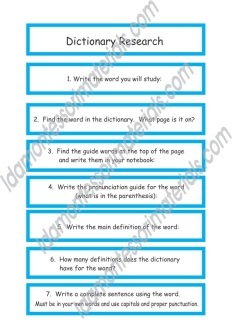 Total of 4 pages, each with three traits and the checklist for each can be printed on the reverse - ideas, organization, voice, conventions, fluency, word choice. 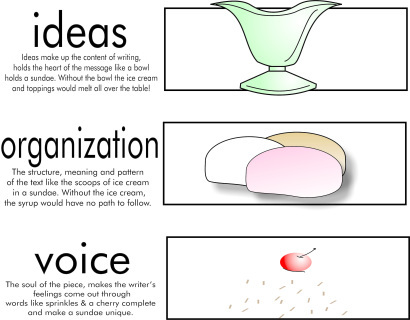 ​Includes PowerPoint of the sundae as it "puts itself together". This set has four different sets of cards that can be matched. They are printed on different colors for easy separating. 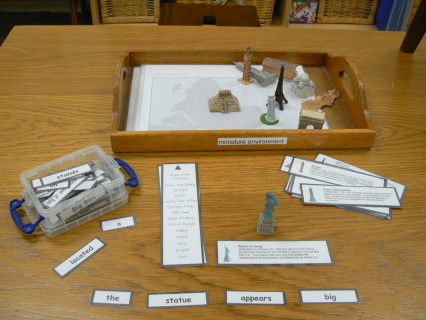 The left word is flush right and the right word is flush left so the children can sort them easily. 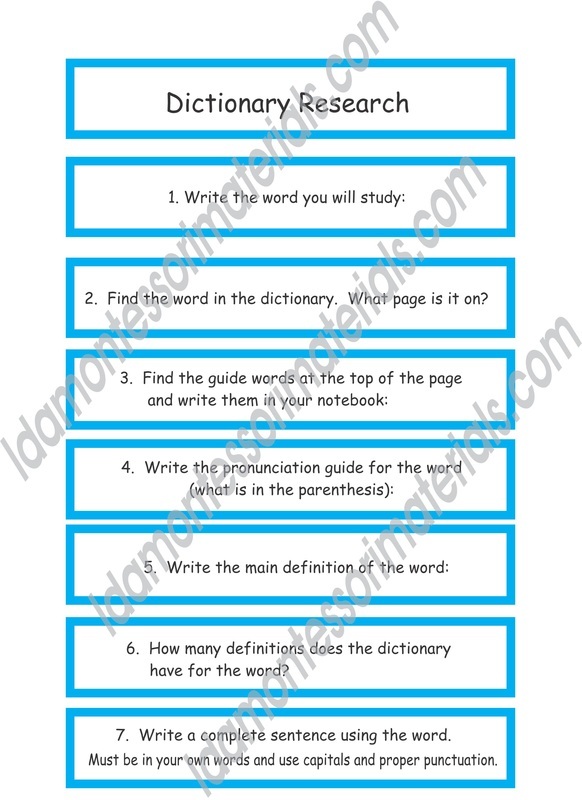 There is a graphic organizer for the children to write each word, draw a picture, then write the new word they create. 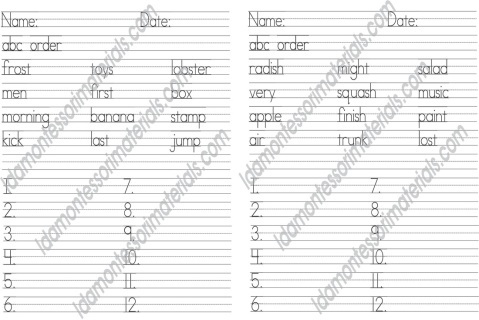 There are control charts for easy checking. 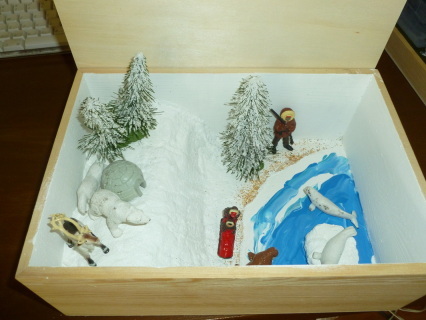 (Box was found at Michael's craft store). 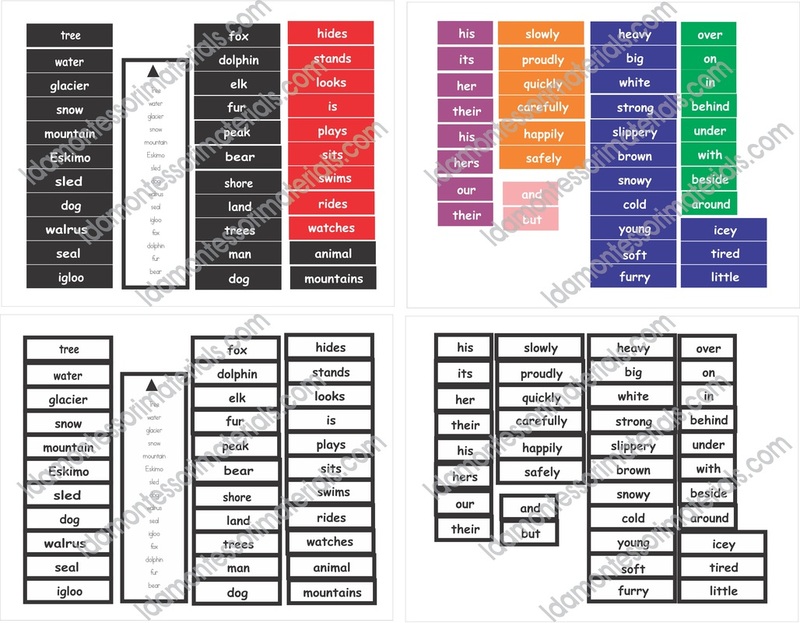 These cards can be printed two sided for use as a word wall. One side has the name, definition and a visual. 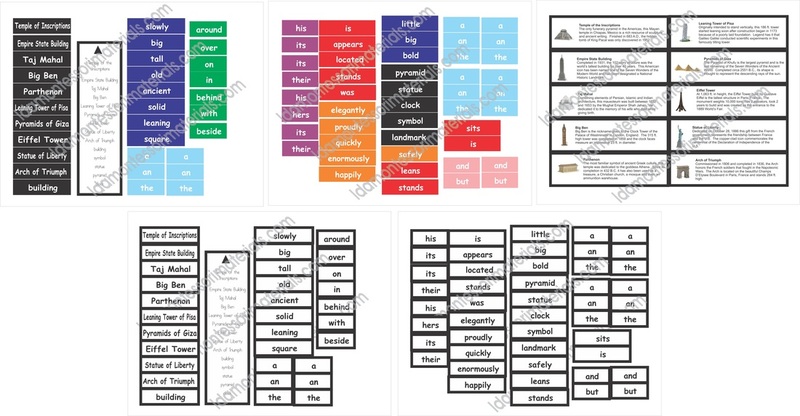 This set has the regular Montessori grammar symbols as well as the advanced (level 2) grammar symbols - infinitives as noun, adjective, and adverb, participles, gerund, and linking verbs. 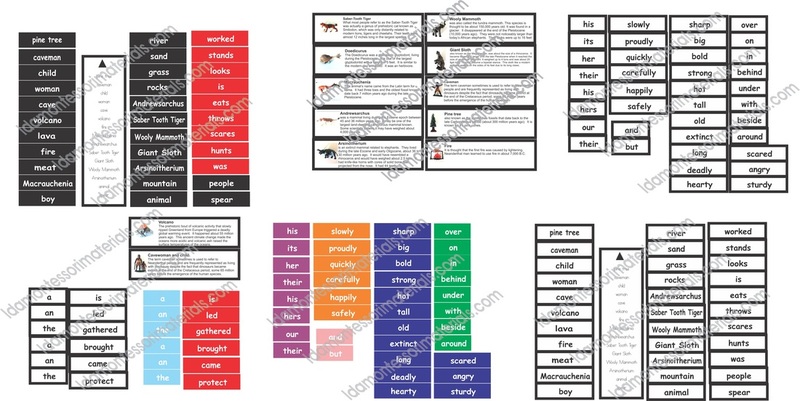 Samples above of grammar symbol cards - 3 per page, can be printed two sided - the page following each visual has just the name of the part of speech for a word wall. 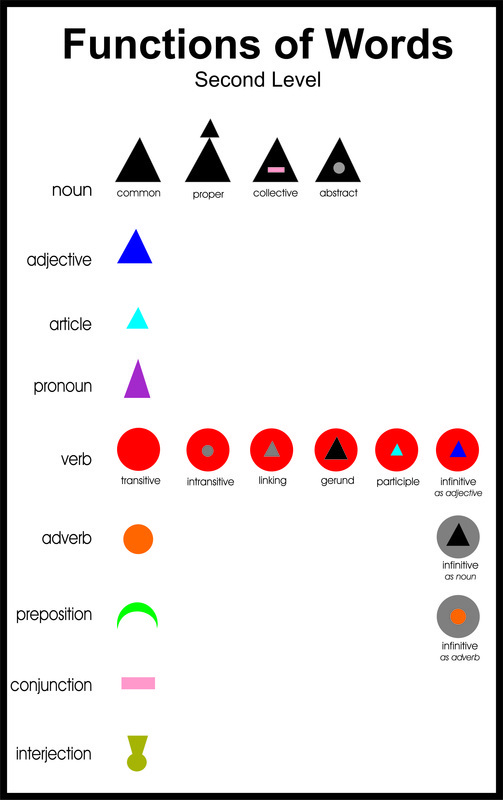 Functions of Words, grammar symbols poster. 8 1/2 x 14 print on card stock and laminate. 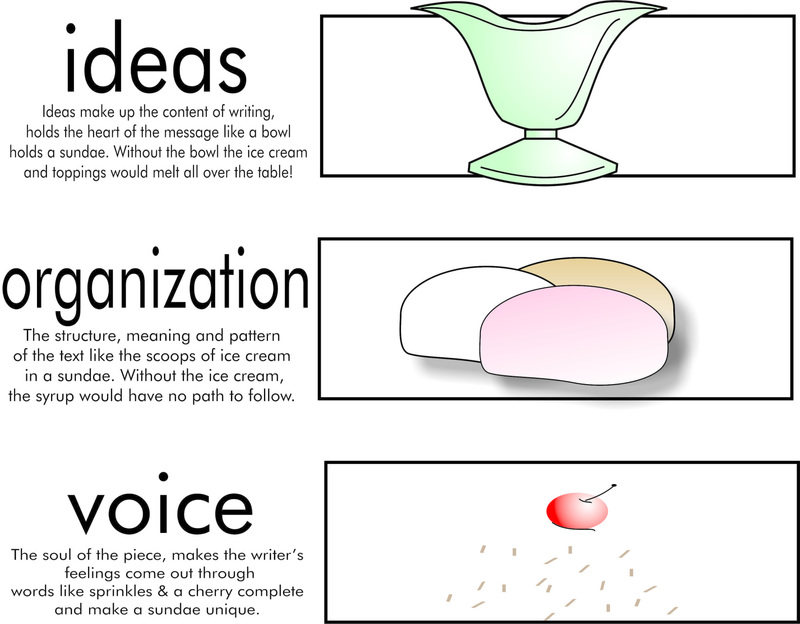 Cards have definitions and visuals on one side. 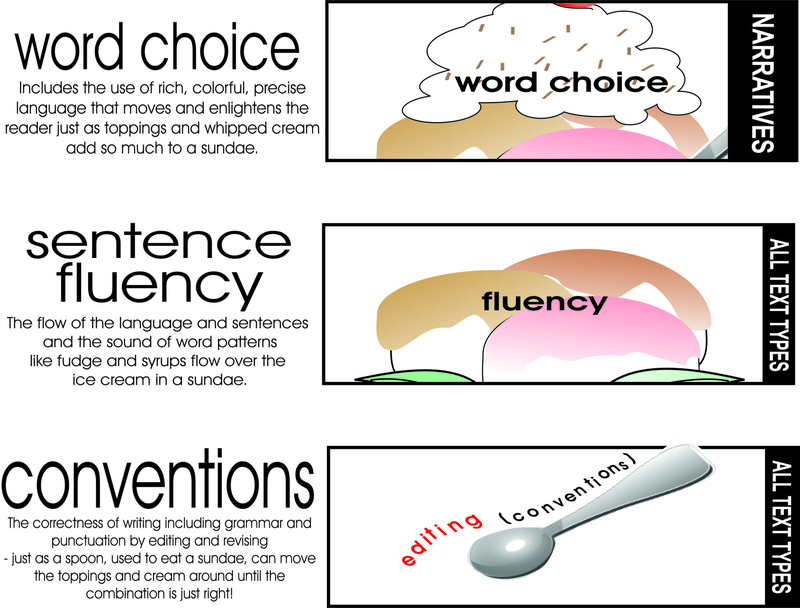 The term can be printed on the back or as a separate card for word walls or for use during any literature, reading, or writing lesson. Over 100 pages of cards, 3 per page for both set one and set two. Email ldaphx@aol.com and request a sample. 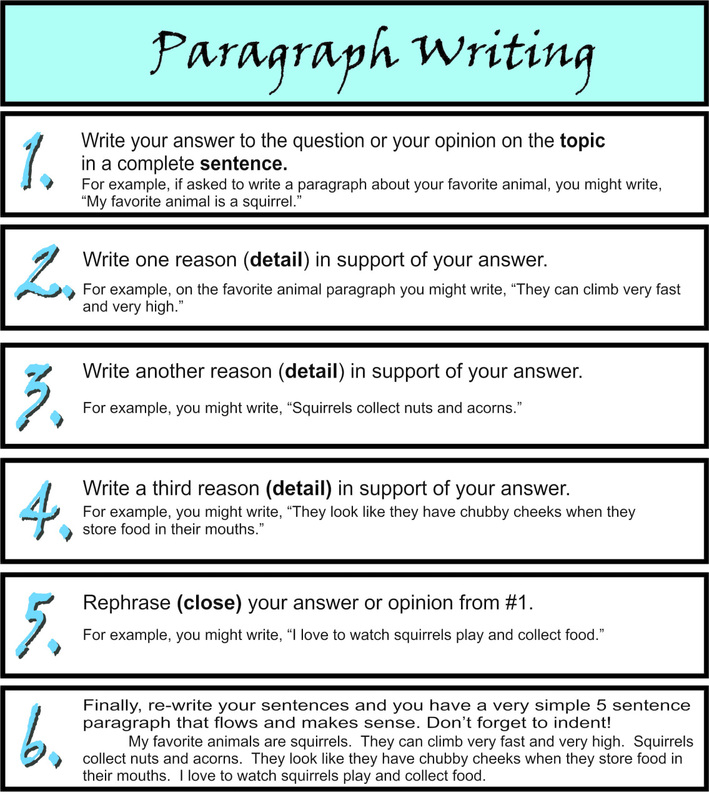 1 set on one 8 1/2 x 11 - print on card stock, cut apart and the children can lay them out in order while writing a paragraph. 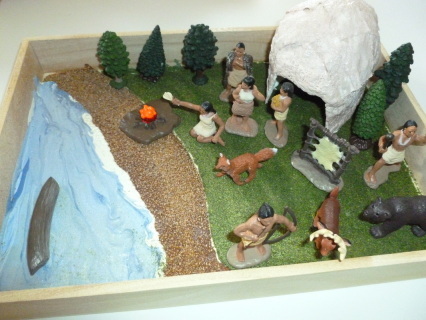 These miniature environments are created using the Toobs sets found in most craft stores and on the website http://www.safariltd.com/. Teachers can get as creative as they like with the backgrounds or boxes/trays. 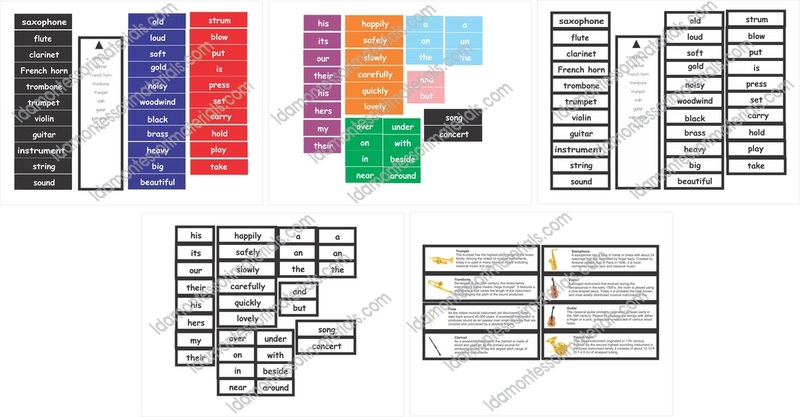 This set contains cards that come in grammar symbol colors and black and white cards. 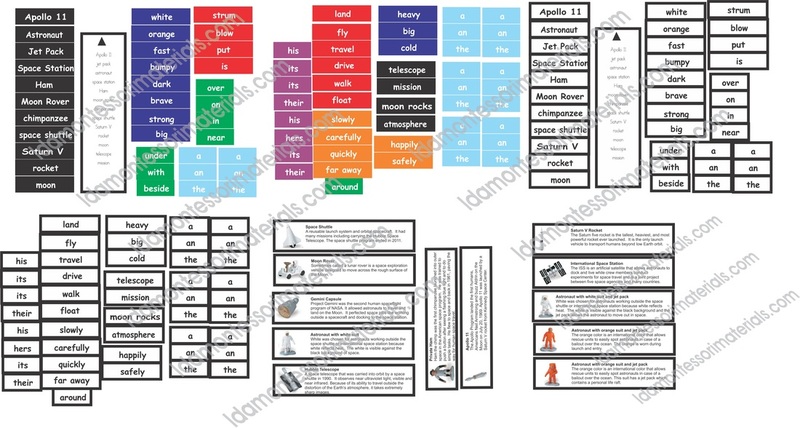 There are also educational information cards with this set. Safari Ltd. has educational information for most of their Toobs. 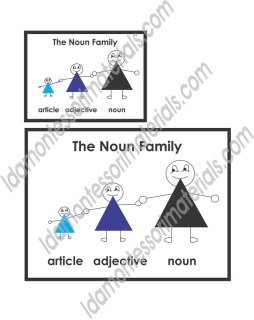 Younger students can set up the environment and create noun families, write them in their language book and symbolize the parts of speech with their stencils or stamps. 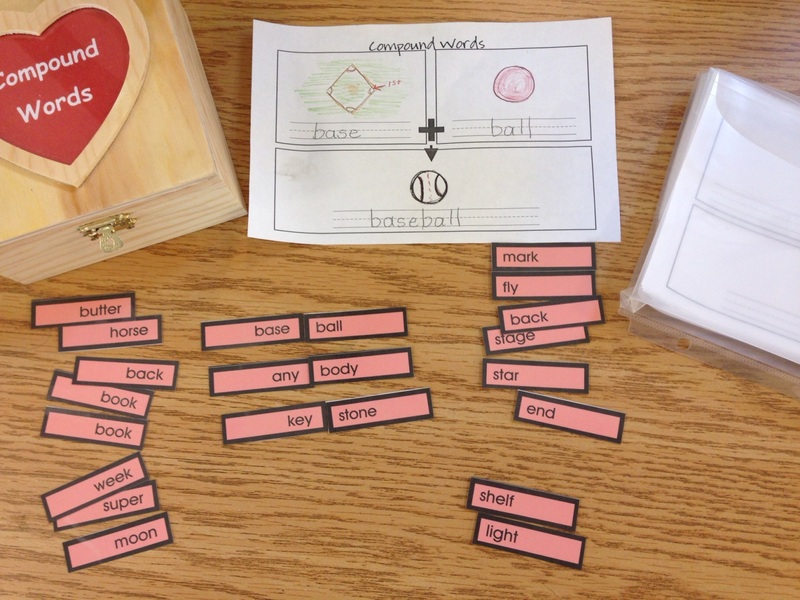 Older students create complex sentences with all of the parts of speech using the non-colored cards. 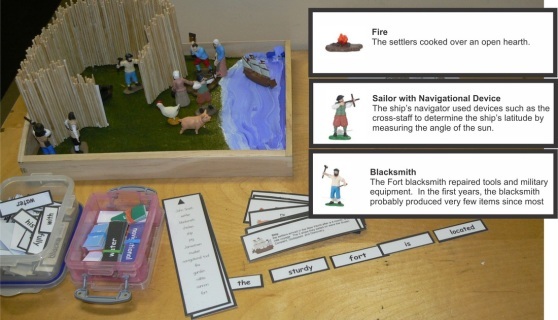 This set includes both sets of cards and the educational information cards. Just print on card stock, laminate and cut apart. Does not include the Toob or the environment. National Geographic has maps on their website of the continents which can be used with this Toob. The children can place the landmarks on the appropriate continent. This set of cards is to be used with the Knights and Dragons Toobs from Safari Ltd. 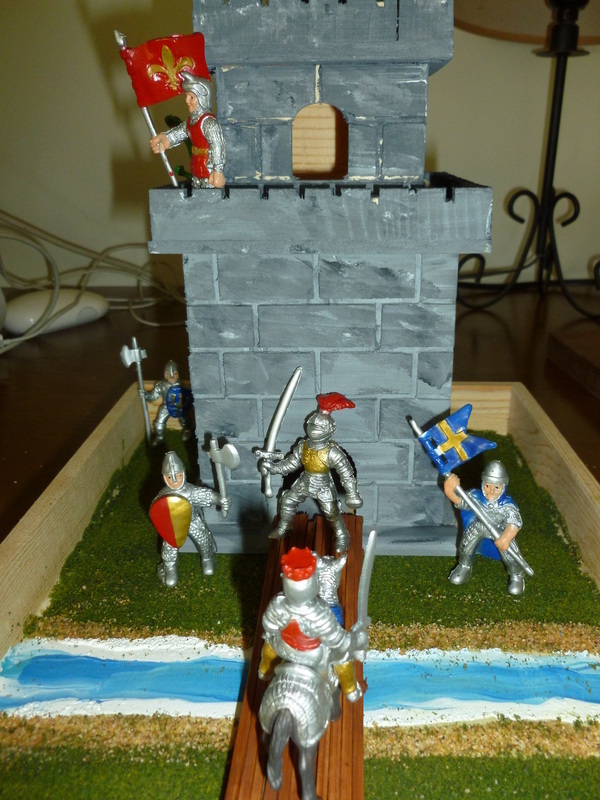 The wooden castle is an unpainted wood birdhouse from Michael's Craft Stores. The box is wooden with fake grass glued on, some sand and paint for the water. I added a draw bridge. Castle not included. Grammar cards that go with the Knights Toob. 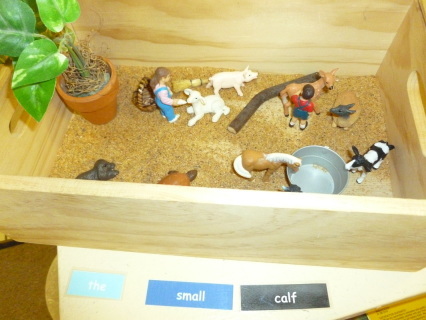 This is an example of how the cards can be used by the children. 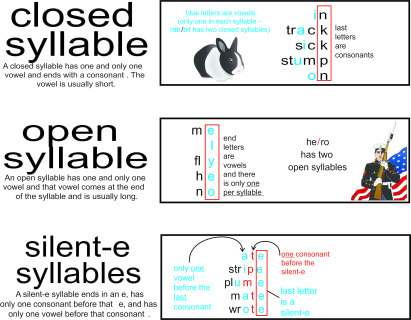 The top shows a simple noun family which they can symbolize and the bottom is a complex sentence in which they need to add punctuation and capitals. Color coded cards, black and white cards for older students and educational cards. Great for continent studies. 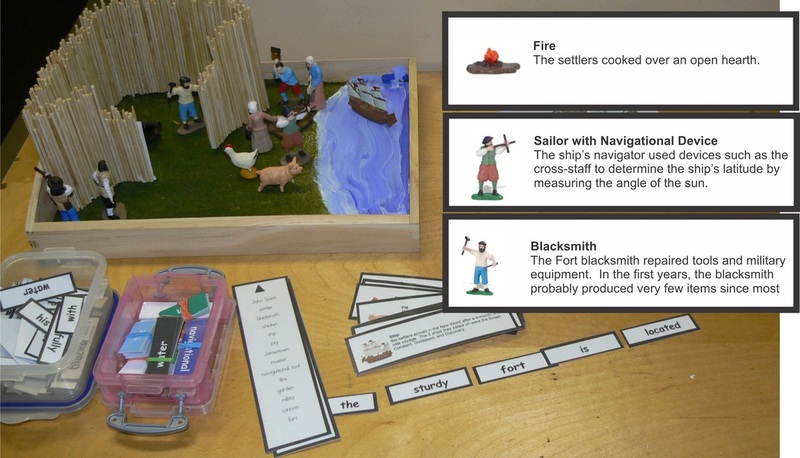 Grammar/sentence cards for the Arctic Toob set. 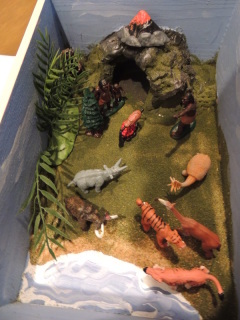 Cards can be used with the Toobs Prehistoric Life figures and the environment can be created with a box, Plaster of Paris for a cave and paint. 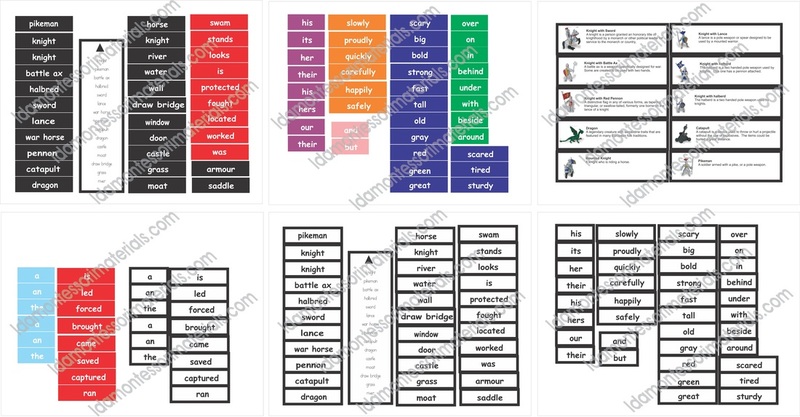 Contains both color coded cards and black and white cards for older students. Also contains education cards for the figures. 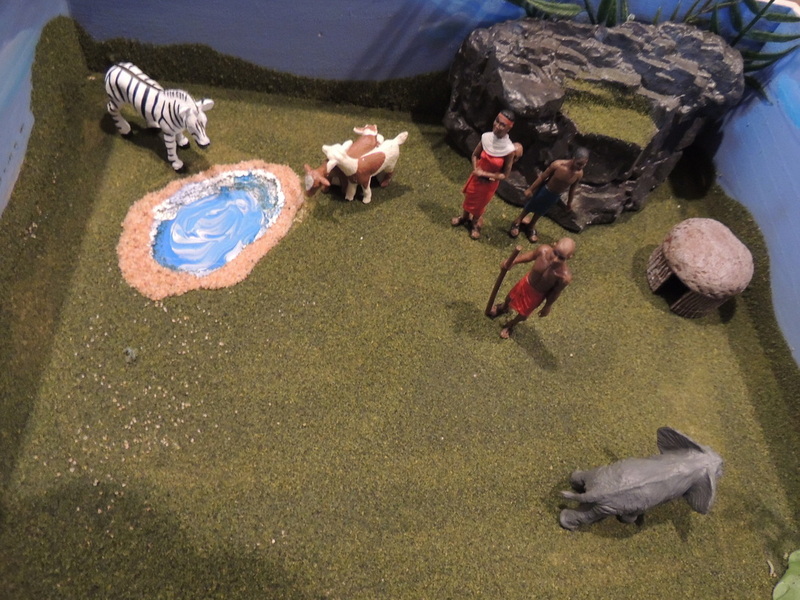 This miniature environment is created using the Toobs sets found in most craft stores and on the website http://www.safariltd.com/. Teachers can get as creative as they like with the backgrounds or boxes/trays. 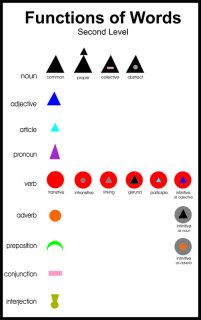 This set contains cards that come in grammar symbol colors and black and white cards. 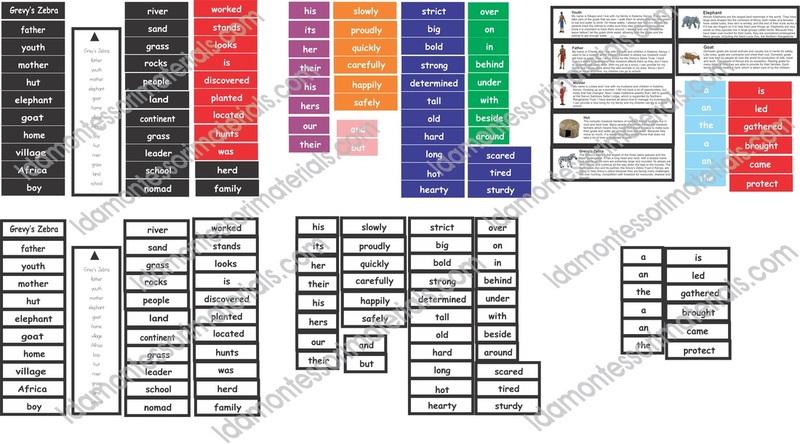 There are also educational information cards with this set. Safari Ltd. has educational information for most of their Toobs. 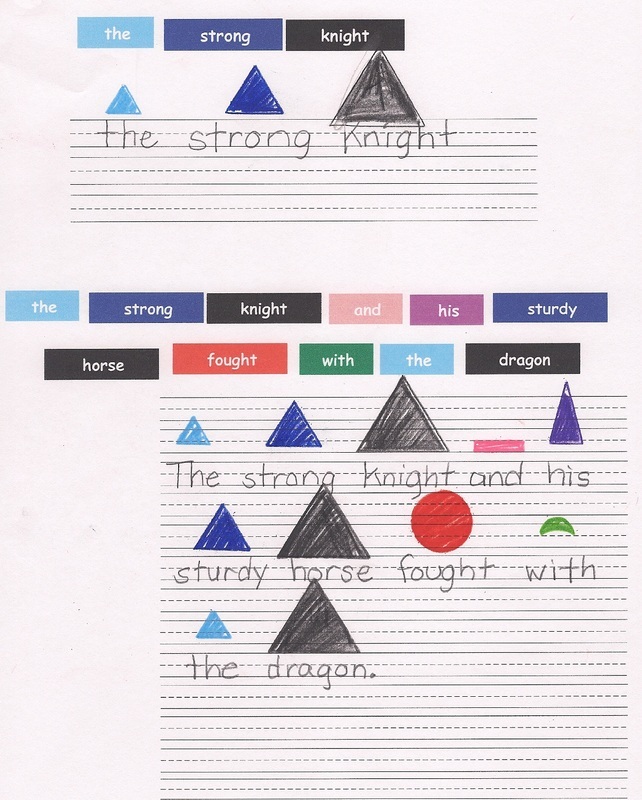 Younger students can set up the environment and create noun families, write them in their language book and symbolize the parts of speech with their stencils or stamps. Older students create complex sentences with all of the parts of speech using the non-colored cards. This set includes both sets of cards and the educational information cards. Just print on card stock, laminate and cut apart. Does not include the Toob or the environment. Color Coded and black and white cards for older students. Educational cards included. 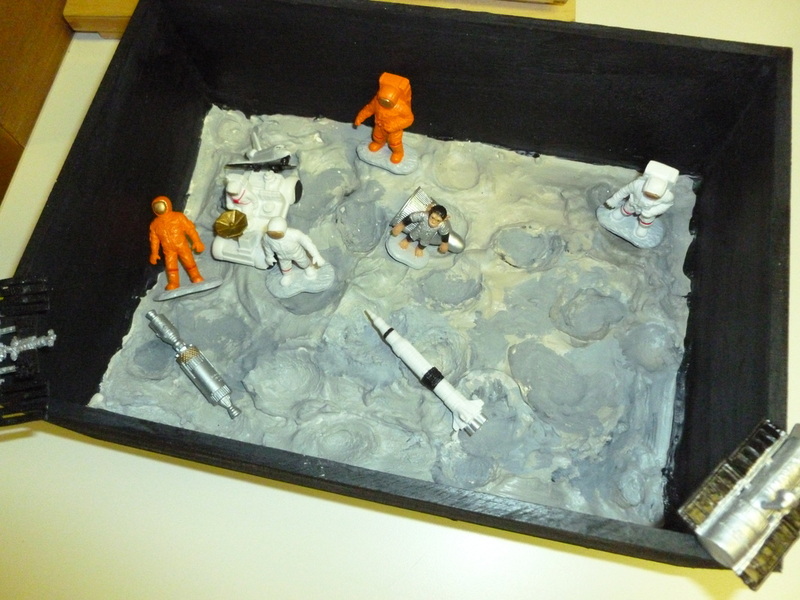 Environment made of plaster of Paris with marbles to create craters. This set goes with the Toobs music pieces. 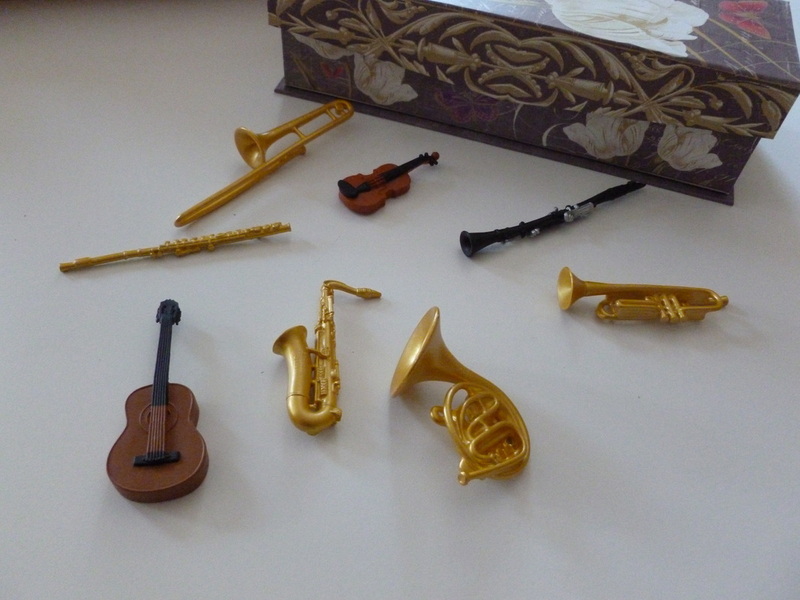 It includes education information about the instruments. Color and black and white cards -no educational info cards. Cards that go with the Toobs farm kit. The barn was crafted with foamcore and placed in a wooden tray with grass that is glued to the bottom. The Noun Family chart can be purchased separately. 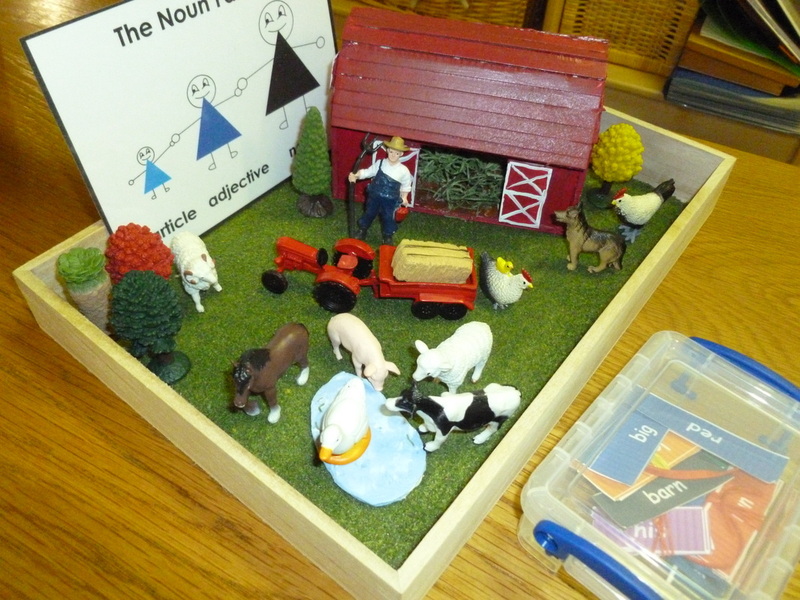 There are also barns that can be purchased at craft stores and painted for this Toob. Farm mini environment cards - no educational information cards. Print on card stock, laminate and cut apart. 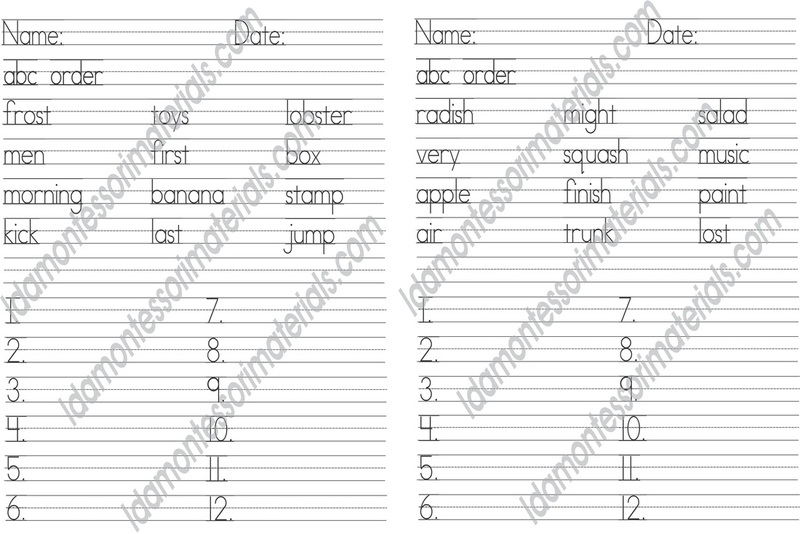 These can be used on an easel or include the small card in your mini environments.